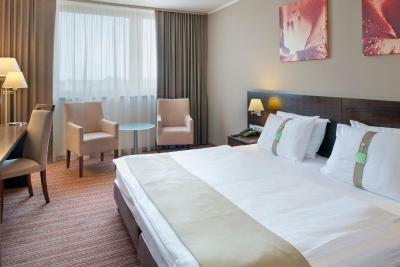 Lock in a great price for Holiday Inn Bratislava – rated 8 by recent guests! Amazing place for staying! We stayed here with my husband and now I booked it for my parents! Awesome! Sauna, steam room, pool, great breakfast- they have everything to make your staying perfect! Quiet, sound proof insulation walls. Nice and comfortable king size bed. Rich breakfast. I travel every year to Bratislava in this period of the year and I always stay in this hotel. The rooms are large and clean, the staff is very helpful and nice, they have a swimming pool and a gym and are located in a good area for me. I always enjoy my stay here. Breakfast was excellent, room was very clean and the staff was very nice. Breakfast was great and tasty but last time when I was there there were more options and more desserts but food coffee and juice was excellent. Also I always book king size beds but always get at least in one room separate beds that should be correct next time when we come. Great facilities available at the hotel. Rooms are big and bed and pillows are very comfortable. Holiday Inn Bratislava This rating is a reflection of how the property compares to the industry standard when it comes to price, facilities and services available. It's based on a self-evaluation by the property. Use this rating to help choose your stay! Holiday Inn Bratislava is located 10 minutes on foot from Forum Business Center, as well as half way between the Old Town and the Bratislava Airport, 3.1 mi from each. A bus to the city center stops 650 feet away. Guests have free access to the indoor pool, the fitness center and the sauna. Thai massages and a tennis court are on site as well, available at an additional cost. 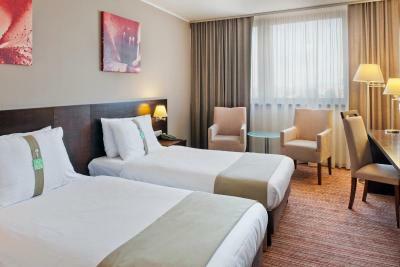 When would you like to stay at Holiday Inn Bratislava? 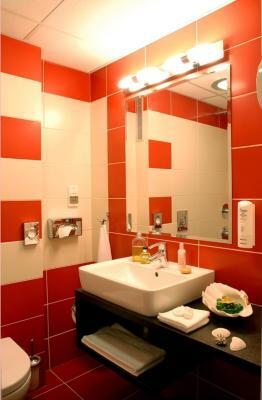 This room is nonsmoking and comes with 2 large single beds or 1 large double bed. This suite is nonsmoking and comes with 1 large double bed as well as a seating area with a sofa. This room is nonsmoking and comes with 2 large single beds. This room is nonsmoking and comes with 1 large double bed. 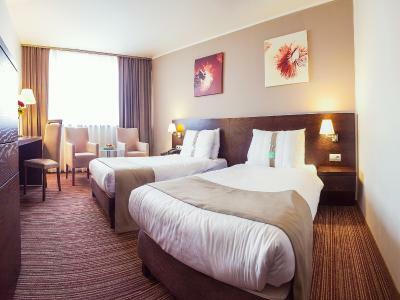 Holiday Inn Bratislava hotel is a member of the international hotel network Intercontinental Hotels Group where proven standard ensures the highest level of service quality and your ultimate comfort. Thanks to the convenient traffic location, conference facilities and a friendly "can do" service the hotel is an ideal place for you business trips as well as private events. House Rules Holiday Inn Bratislava takes special requests – add in the next step! Holiday Inn Bratislava accepts these cards and reserves the right to temporarily hold an amount prior to arrival. More desserts for breakfast. Warmer pool or at least pool room it’s okay for 5 minutes but after that gets freezing. It needs to be warmer. The shower curtain! It's too short. Every time we took a shower we flooded the bathroom. Hotel is out the way of most things. Taxis arranged by the hotel were quite abit more expensive than taxis getting back to the hotel. Everything was great. My favourite hotel in Bratislava. Very old hotel with furniture 20 years ago.. not best location - nothing is around if you dont have a car. Hairdryer was broken, some dust in one of our rooms, the pool and sauna were not working in two of the days (it was holiday but we were not informed when we booked the rooms). Nice room, beds were comfortable. The workers in the swimming pool were really rude and the sauna facilities are very old. Quilts on large double beds are ridiculously small and not adequate for 2 people!! Not centrally located but 5 mins with taxi from the center. Nice room, better than in other Holiday Inn hotels. Modern furniture, great spa area, good chek-out time.